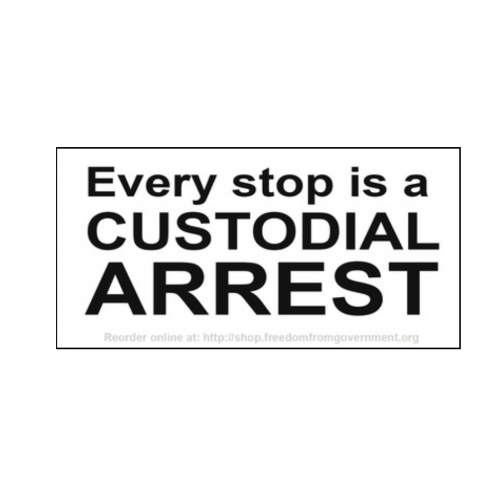 Get the "Every stop is a CUSTODIAL ARREST" sticker 2 for $5. Measures 4 inches wide by 2 inches tall. 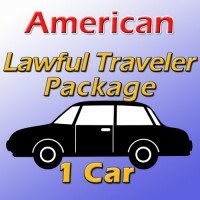 MINIMUM ORDER OF TWO STICKERS for $5 plus shipping. Save when you order in bulk! 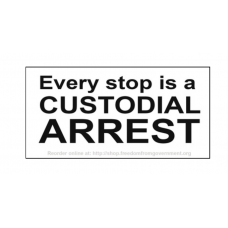 Use this sticker somewhere in a conspicuous place to notify the state officials acting under color of law that if you are not free to leave than that actually constitutes a custodial arrest. There is no such thing as a "custodial detention" by the way. 1. To obstruct; to stop; to check or hinder motion; as, to arrest the current of a river; to arrest the senses. The term “custodial” refers to the suspect being in custody. It doesn’t necessarily mean handcuffs. 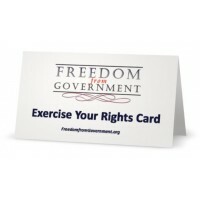 Rather, it means that the police have deprived the suspect of his or her freedom of action in any significant way. Who asked the questions? Was it a police officer? A prison guard? 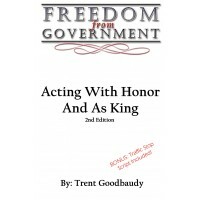 Was the questioner in a position of authority? Was he or she carrying a gun? The identity of the questioner goes to the intimidation level of the interview. 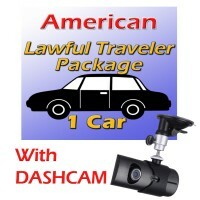 For example, a court may consider an armed police officer or prison guard more compelling than a postal inspector. How many officers were there? More officers points to a more coercive setting. Who else was there? A court may find a situation less coercive if the suspect is surrounded by friends or family. Who initiated the discussion? A suspect walking up to an officer and asking questions suggests a non-custodial situation. Did the officer tell the suspect the interview was voluntary? If so, a court is more likely to consider the interview non-custodial. Where did the questioning take place? Was it at the police station? The suspect’s house? On the street? In a hospital room? The issue is how familiar or coercive the setting is to the suspect. An interview at a police station, for example, would likely be more intimidating than one on a sidewalk. Did the officer use any force on the suspect? If an officer used force prior to or during the questioning, a court may consider it a custodial situation. Did the officer use any physical restraints? Was the suspect able to move around? Restriction of movement supports a finding of custody. What time was it when the conversation took place? Was it the middle of the night? Or during the day? An interview at an odd hour may point to custody. How long did the questioning last? Longer interviews lean toward a finding of custody. What was the style of the interview? Were the questions accusatory or routine? An interviewer accusing the suspect of certain acts in a threatening manner may indicate a custodial situation. Was the suspect free to leave at the end of the conversation? A “yes” answer tends to suggest that the suspect wasn’t in custody. When considering the above questions in order to determine whether someone was in custody, most courts use what’s called a reasonable person standard. The central question, which the questions above get at, is whether a reasonable person in the same position as the suspect would have felt free to leave. 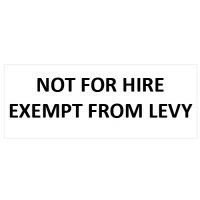 Use this sticker somewhere in a conspicuous place to notify the state officials acting under color o..